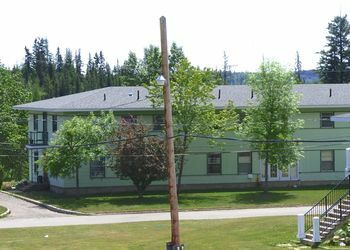 Baldy Hughes Air Station (1953-1988) - A Cold War U.S. Air Force Radar Station first established in 1953 during the Korean War near Prince George, British Columbia. One of the Pinetree Line radar sites. Initially assigned a Permanent ID of C-20, later a Sage ID of C-20 and then a JSS ID of R-34. The site was transitioned to the Royal Canadian Air Force (RCAF) on 1 Mar 1963, first as RCAF Baldy Hughes and later designated CFS Baldy Hughes. Named after the original homestead the site was built on. Closed in 1988. 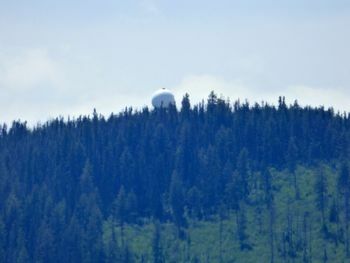 Part of the Pinetree Line radar chain and one of 21 USAF radar stations designated to be turned over to the Government of Canada. The radar station was constructed between 1953 and 1955 but was occupied in 1953 with the relocation of the 918th AC&W Squadron from Geiger Field WA to the newly constructed radar station. Initial equipment included the FPS-3 search radar and a TPS-502 height-finder radar. In preparation for SAGE System operation a FPS-20 search radar was installed to replace the FPS-3 and FPS-502. In July 1960 a FPS-6 height-finder radar replaced the obsolete TPS-502 and in February 1961 a second FPS-6 height-finder was added. This configuration (a SAGE qualified FPS-20 long-range search radar and two SAGE qualified FPS-6 height-finders) met the requirements for transition to SAGE System operation. The SAGE annex to house the FST-2 and SAGE operations at Baldy Hughes AFS was started on 1 Nov 1960. Construction of the SAGE annex and installation of the FST-2 equipment was completed in July 1962. July 1962 also marked the completion of the SAGE GATR building. Former McChord SAGE Direction Center DC-12. The site had begun operation as a SAGE site in March 1960, initially feeding manual data to the McChord SAGE Direction Center DC-12. Automatic SAGE operation with DC-12 began on 1 July 63 with the FPS-20 and FPS-6 radar configuration. The search radar was then upgraded to an FPS-27 and that replaced the FPS-20 in May 1964. An FPS-26 height-finder radar was installed to replace one of the FPS-6 height-finders on 20 Mar 1964. At the end of 1964 Baldy Hughes was operating an FPS-27 search radar, an FPS-26 height-finder, an FPS-6 height-finder, and a UPX-14 SIF/IFF radar. In December 1971 the obsolete FST-2 was replaced with an FYQ-47 data processor. In April 1975 the FPS-26 height-finder was shut down. In 1983 when the SAGE System shut down, the radar station was connected to the Canada West ROCC until Baldy Hughes shut down in 1988..
CFS Baldy Hughes was deactivated in 1988. The physical plant of the site was divided into an upper main operations site, a lower cantonment area, and two radio sites. The main site housed the operations building, the radar towers, the backup generators and later the SAGE Annex. The cantonment area housed the enlisted barracks, the bachelor officer's quarters, the orderly room, the chow hall, the motor pool and other support buildings. Apart from the cantonment area were two trailer courts for married personnel. A separate radio site housed the radio equipment for directing aircraft intercepts. Like most early radar stations, Puntzi Mountain originally had a radio transmitter site and a separate radio receiver site used by local controllers for voice direction of fighter interceptors to their targets. With the SAGE System, the SAGE Direction centers had the primary task of directing intercepts and the local radio sites were reconfigured, usually into a single site that was known as the Ground to Air Transmitter Receiver (GATR) site. The GATR site communicated with the interceptors from either the local site or the SAGE direction center via voice commands and/or a digital data link. 16 Apr 1952 - Activated at Geiger Field, WA, as the WADF. 1 Jun 1953 - Moved to Baldy Hughes, B.C., Canada. 1 Mar 1963 - USAF Squadron Discontinued, site transferred to RCAF. Apr 1988 - RCAF Operations end. Repurposed near Prince George, British Columbia. 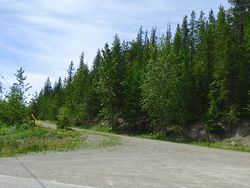 Location: At the end of Blackwater Road, 19 miles southwest of Prince George, British Columbia. This page was last modified 16:58, 12 February 2019 by John Stanton. Based on work by Bill Thayer.